The WSA Studio team in Columbus, Ohio strikes gold again with this project for Motorist Insurance Group. This is actually a separate entity that is under the Motorist umbrella called NewCo. NewCo's role within the Motorist Group is specifically to sustain their commercial insurance lines. NewCo came to WSA Studio with very specific needs and requirements that I won't get into in this post. What I do want to get into briefly is the presence of people in architectural photography. I have mentioned this before in passing but it seems to be a more frequent request in the last few years. These spaces and buildings are designed for people so it is important to show people using the space. It gives scale to the images, displays the functionality of the spaces, adds life to the project, to name a few reasons. The photos I make are meant to tell the story of the projects not just show what they look like. The best way to bring the story to light is to include people using the space in it's various forms. It's a lot more work to have people in your photography but it's well worth it. There is more planning involved during the scheduling phase, and it's more complicated lighting a space when people are present. Throughout the course of a full day shoot with people we complete a fewer number of photos, but the quality of the images is much greater. There is something about this project that really effected me. I actually can't put my finger on it but I will try for the sake of desperately needing to post on my blog. It's been a busy 3 months and I haven't even thought about posting. I am currently sitting in my studio one hundred percent caught up on all my editing and the boring business side of being a photographer. Like I said before, there is something about this project I shot during my blogosphere hiatus. It's effectively named Urban Park. 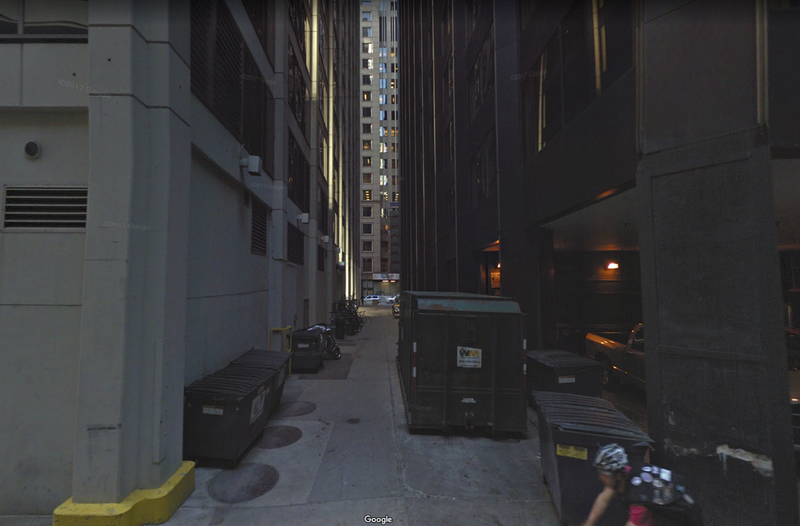 Shive Hattery was tasked to take a regular old grimy old alley on West Monroe between Franklin and Wells downtown Chicago and turn it into a community gathering place. I'm talking not just a place for people to rest and smoke, but a place where people can come outside and be inspired, excited, comfortable, re-cafinated, rejuvenated, and any other buzz word that might drive my point home. You get the picture, (Actually, you just looked at it). The team at Shive Hattery hit another grand slam. Now that is a sweet place, am I right! Let me drive my point home a little more by showing you some before screen grabs I snagged from Google Maps. One of the most exciting things about my job is that I get to witness and document the renewal of cities and spaces. I get to witness nothing become something, or something old become revitalized. This project perfectly represents that, it makes me filled with joy to be an architectural photographer. The hard work architects and designers do really does make the world a better place. I have proof! Motorola Employee Credit Union recently went through some major changes. They started serving the public outside of just Motorola employees and grew exponentially. With that growth came a name change to Andigo and a need to update their corporate headquarters in Schaumburg, IL. They decided to approach the change in a way that goes against what you typically see with a financial institution. They didn't want the space to have the look and feel of a bank but rather a high tech and forward thinking vibe. Coming into the shoot I knew this was the approach decided upon by the bank and executed by Shive Hattery. The spaces are extremely moody and dramatic, so in order to capitalize on their look I implemented a specific style of supplemental lighting. There is actually quite a bit of lighting going on on my part but I lit the spaces in a way that mimicked the existing lighting but brought some details out in the shadow areas. Sometimes I struggle with selecting images to post on the blog because there are too many great ones. This project definitely falls into that category. This is 1001 South State in Chicago Illinois. It's currently the newest high-rise to grace the already amazing Chicago skyline. 1001 is a 40 story residential tower designed by Solomon Cordwell Buenz and constructed by Walsh Construction. This Apartment building has it all, from swimming pools and work out facilities to a bike repair room and a dog run. There are expansive greenspaces on the 5th floor as well as pool and grill areas. This glass-clad building is full of curves and angles giving countless viewing variety to the residents. It seemed like every space we photographed had a completely different view of the Chicago Skyline or Lake Michigan. It's located in the South Loop which is one of Chicago's fastest growing neighborhoods and also includes 7,800 square foot of street level retail space. The building is breathtaking and can been seen from virtually all angles throughout the south loop. The image above is an example of a two bedroom apartment facing south west with fantastic views of Lake Michigan. Above - The south facing penthouse suite. Above - 40th floor residence lounge with a never seen before angle of the chicago skyline. "Observation is a passive science, experimentation is an active science"
Photography is a combination of passive and active science. I've spent years observing spaces and experimenting different ways to photograph them. Many factors come into play: light, composition, camera angle, exposure time, aperture, and time of day - to name a few. I don't often shoot at dawn, which is rare for an architectural photographer to say. Most photographers absolutely love shooting at dawn but, I have just always preferred the dusk image. Here's an experiment on shooting at dusk vs. at dawn that I conducted while shooting the new Iowa Culinary Institute building in Des Moines. The dusk shot seems to become more about seeing into the space and how the exterior ties into the interior. The brightest points of the image are in the building drawing the viewers eye inside. The cloud movement actually points you into the space as well. The image reveals not only the exterior and interior architecture but also the lighting design. The interior is darker which tells the story of the form of the exterior more efficiently than the dusk image. Most design takes the environment into account, with more available daylight, the dawn image reveals the context in a stronger way than the dusk image. If I would have made the dawn image much earlier in the morning it would be drastically different and closer to the dusk image. Both images bring value in their own specific way. It is really interesting to me how making two images from the same spot at different times of day can be totally different. I've always thought this airport was one of the architectural icons of the Quad Cities. Every time I travel to and from the Quad City Airport I find myself wondering why it was never photographed and hoping that someday I would get the chance. Well, I am happy to say that I finally got that chance! This was an interesting project for me for several reasons. One being that the Quad City International Airport expansion was completed in 2001. Typically when I photograph a building or space it has just recently finished construction. So why am I shooting this project 15 years after completion? Simply put, it has never been professionally photographed and the Airport needed some high quality images for their marketing efforts. This 18 million dollar terminal expansion was designed by Gere Dismer Architects (now Studio 483) and it is as beautiful as it was in 2001.So all you local Quad City folks like me, be on the lookout for these images to start popping up around the QC Area! The Forge is part of a technology company called Pillar based out of Columbus Ohio. Pillar is growing exponentially and has opened several new locations over the last few years. This is their 4th location and first one in Des Moines, Iowa. The design firm WSA Studio (also out of Columbus) reached out to me to photograph this project. After several weeks of planning my assistant and I made the short trip to Des Moines. Upon arriving I knew we were in for a long day. All projects have problems to be solved and this one was no different. Lucky for us this specific problem was that we only had one day to photograph the space and we were seeing way to many angles that needed to be captured. Through the process of elimination we selected 7 shots that would tell the story of this project the best and went to work. Above is a behind the scenes look at us creating one of my favorite shots of the set. One of the most challenging aspects of lighting a wide shot of a space is finding places to hide my supplemental lighting. If you look hard you should be able to see one of the lights tucked between a glass wall and a pillar. I want to take the time to give an official shout out to my assistant Payton. We have been working together for over a year now and I have to say that his work is invaluable to me. We ended up finishing this shoot a little early so we decided to make one more image with a twist. The twist, Payton and I switched roles. I became his assistant for the image below. Payton composed this shot and we collaborated on the lighting. The imaged turned out great and quickly became one of my favorites of the set. Well done buddy, and thanks for not making me get you coffee. I've been waiting a long time to share these images. If you recall I shared a behind the scenes look at our shoot in Southern Arizona with Dust. Well, I can finally share with you a few of the final images. Casa Caldera was recently selected by Architectural Record as one of the record houses of 2016 and is featured in the latest issue of the magazine. It was an honor to photograph this project for them. We will also be releasing a video feature about the project very soon, so stay tuned for that! The above shot is probably my favorite of the set. I am sure it is because this is the image I am the most emotionally and physically invested in. This photo took about 4 hours to set up between wrestling with the lights and composition. It was very exciting to get it nailed down and I can't wait to share the time-lapse. I am not going to say much else here because it will all be explained thoroughly in the upcoming video. I hope you enjoy looking at the photos as much as I enjoyed making them. I recently was asked to shoot a brand new store in Highland Park, Illinois called Summer Classics Home Store. The store is going to be featured in the up coming Hearth and Home Magazine. For those of you that don't know Summer Classics is a high end outdoor furniture brand based in Alabama that has 13 stores in the US. I always love when I am asked to shoot a high end retail space because their lighting does a lot of my work for me, and this store was no exception. I had to add minimal supplemental lighting to brighten up the shadows a bit but that was it. hey also asked me to make a couple environmental portraits of the store owner for the magazine feature. I don't get to do this very often anymore and was very excited for the opportunity. The store had amazing natural light so we decided to make his portrait using existing window light. We are all pretty happy with the results and I was glad to dust off my old portrait chops. Like I have said before, good pictures require a commitment. Rather than just taking a snap shot we need to spend a little time to explore our chosen subject. Often, I find that the first picture I take of a subject is the least interesting. For this tip I am stealing a rule from videography. When learning how to shoot video one of the first things I was taught was to shoot in sequences. This simply means start with a couple wide shots and then move in closer and closer making shots along the way. The images above are a series I took downtown Chicago of the staircase leading up to the train. I started at an angle from a distance, but because of my hatred for zooming in with a cell phone I couldn't capture the image I was really wanting. I scratched the idea and moved in closer. I do like the second image and could have stopped there but I decided to keep exploring the possibilities. The third shot I took ended up being by far the best of the group. I got to the base of the stairs right as the woman in red shoes was approaching. I would have totally missed this opportunity if I did not commit to exploring my subject and shooting a sequence of images. Here is a rare case where I like the first shot from a sequence best. Even though I was satisfied I still went in closer just incase there was an even better shot. I did not find it this time, but I did get a good example of shooting in sequences even if you are satisfied with the first capture. To be completely truthful I came back to this a couple hours later with a fresh mind and got a closer shot that I love. Here are a couple more examples of shooting in sequences. I would love to see some of your images using this technique. You can e-mail them to me at aj@ajbrownimaging, use #abiphotochallenge on instagram, or just leave a comment with them in the comment section. In late October I had the pleasure of traveling with good friends and fellow photographers Josh Ford and Payton Shumaker. We went to Southern Arizona to photograph a private residence called Casa Caldera that was designed and built by Dust Design Build. It was quite an experience! I can not share the final images or video with you just yet but I did want to give you a behind the scenes look at the week we spent off the grid just a few miles north of the Mexican border. To say Casa Caldera is remote just doesn't do it justice. This is a shot of the private dirt road we traveled on for over an hour to get to the site. As you can see the road before the dirt road was, well to be honest, it was dirt too. This is Josh, Cade (architect), and I overlooking the mountain range where Casa Caldera hides. By design, we literally could not see the house until we were about 40 feet from it. Once we finally arrived we took a moment to take in the beautiful views. To give you an idea where we are, the US, Mexico border is on that mountain range in the distance. Here we are talking to Jesus Robles and Cade Hayes about the project. The time, effort, and passion they put into their work is remarkable. I love this picture because it captures one of the most interesting conversations I have had with clients. These two men inspired all of us with their passion and love for their work. This is a shot of us interviewing them for their video. This is my favorite picture of Josh and I working together. He is an amazing photographer and an absolute pleasure to work with. Here we are setting up the dusk shots as they are fast approaching. Josh and I setting up the interview shot before Cade and Jesus arrived. We eventually moved the shot outside for audio reasons. Speaking of audio, this is a rare picture of Payton setting up the audio for the interview. Unfortunately this is one of the few shots of Payton because he was busy all week taking all these great behind the scenes photos. After the interview we had a few adult beverages and talked shop with the guys from Dust. This is Jesus showing me just how committed he is to his work. This is a shot of us in a rare moment sitting down to eat dinner and watch a terrible movie that I will not name here. Attempting to fly the drone through the zaguan. I'll just say flying these things is not easy, but Josh did get the shot we were looking for. It takes at least two people to properly fly a drone and capture video. One to fly and watch the monitor to make sure we get good footage and the other to scream if its about to hit something. After the interview we spent a little time making a couple portraits of the Dust guys. This is a shot of me inspecting the lighting for the living room daylight shot. We drank a lot of these. This is a mesquite cold brew coffee from Exo Roast Company in Tucson, and it is probably the best iced coffee I have ever had. The last day of the trip we drove back into Tuscon to get a few shots of the city and visit a few art galleries before returning to the cold Midwest. I had no idea that Saguaro Cacti were so huge! This is a shot from the plane as we left Tucson. It was an amazing trip and we can't wait to share the final video and still images with you. Fortunately, I have been really busy lately and haven't taken the time to post on the blog as much as I would like. I did want to get on really quick and post about a shoot I did a few months ago at the Hillshire Brands Corporate Headquarters in Chicago, IL. The Hillshire Brands umbrella is huge, Jimmy Dean, Ballpark, Tyson Foods, Sara Lee, to name a few. This office is huge at 230,000 square feet, so choosing 3 images to show you on my blog was quite difficult. The office won the award for best corporate office over 10,000 square feet in 2013 from the The American Society of Interior Designers. It was a lithography and printing plant before Hillshrire Brands and Perkins + Will got their hands on it. The project took 11 1/2 months to design and construct. The busyness of a large corporate office always creates a very exciting shoot with unique problems to solve. To add to the challenge I didn't have an assistant for this shoot because it was on the end of a trip with shoots several days in a row. In the end I think the images turned out nice. Sorry for the short post. I have a lot of things in the air right now but I wanted to get something up because it has been well over a month since my last blog post. A couple weeks ago I photographed the brand new Hamilton Elementary School in Moline, IL. I have to say this shoot was unlike any I have done in the past. I was honestly a little intimidated coming into it. Shooting a space like this takes a lot of concentration and problem solving to get the compositions and lighting just the way I like it. During the pre-planning of this shoot Legat Architects and I decided that because of the size of the school the story of this project needed to be told with a lot of students rather than just a few here and there amongst empty halls. After all of the planning and coordinating with parents was done we had about 20+ children that I needed to incorporate into all of the shots. They were all excited to help us out and have their modeling debut. I am glad to say it went great, the kids were fantastic and took direction very well. I think we all ended up having a fun time. Legat Architects, Russell Construction, The Moline School District, and myself want to thank all the students, parents, and teachers that were willing to make this shoot successful. This tip is easy, just get closer! I often say a great composition is just as much about what is in the photo as it is what is left out. "If your photos aren't good enough, you're not close enough." In my early days of exporting the medium of photography the Robert Capa quote above changed my vision forever. I have seen so many non-committed images. Get up from where you're sitting or get on your hands and knees to get close enough to make your image great. Commit to the image, you'll be glad you did! Capa was a Hungarian war photographer in the first half of the 21st century. He photographed the Spanish Civil War, World War II, and several others. So if Robert Capa can get closer to his subjects in war, you can get closer to whatever it is your trying to shoot because most likely it won't kill you. I had someone comment saying that sometimes you can't just get closer because you loose so much quality in the photo. I just want to make it clear that I am talking about getting up and moving closer to your subject, not zooming in. Zooming in with your cellphone is always a bad idea, you will loose a great deal of quality. I never do that. If I need to get closer to make a good picture but can't, I just don't take it (at least with my phone anyway). I'll share my favorite image on this blog and the AJ Brown Imaging Facebook page. A few weeks ago we had the opportunity to photograph at the Moody Bible Institute downtown Chicago. They had just completed a remodel of their Culbertson Hall. It is a beautiful space and we had a blast shooting it. In todays architectural photography world if you are shooting a space with no people in it then you are doing it wrong. It has been a trend in the industry for years and for good reason. These spaces were designed specifically for people. Showing off projects with no people make them seem a little bare and lifeless. Adding people to the photographs also helps the viewer understand the scale of the space and imagine themselves in it. Adding people to architectural photographs is a completely different animal. Not only do you have to light the space well, you have to light the people in the space in a complementary way too! This raises many challenges in the positioning and power of the lighting. We were scheduled to shoot the week before students got there so finding people to include in the shots was rare. We ended up using a couple students we bumped into, a few young looking staffers, and my assistant Payton (who still looks 19.... his words not mine) in several of the shots. Desperate times called for desperate measures, in the image above you will find the extremely rare appearance of yours truly!!! Earlier this summer I was contacted to photograph 3 Brookstone stores in the Chicago O'hare airport. I have photographed my share of retail spaces over the years but this was a whole different animal being in the busiest airport in the world! I have to admit it was a little intimidating at first. Will the TSA think all my gear is fishy, will all the people walking by just stare into the camera ruining my shot, will they trip over my lighting equipment? I am happy to report my equipment passed through TSA with flying colors and the people were too busy trying to connect than to worry about some random photographer taking pictures. I after about 15 minutes I was at ease and actually enjoyed the amount of people I had to choose from to include in the shots. These 3 images are of the Brookstone popup store in terminal 1. I photograph Shive Hattery's projects all over the Midwest and beyond, but this opportunity was a rare one. They recently asked me to shoot their own brand new office in Iowa City. Of course, I am honored and consider myself lucky to continually work for such a great company. Naturally, they designed it themselves and it is beautiful! Over the years I have been able to visit countless architecture and design firms. This time I was really thinking about how important it is for a design firm to have a great space to work from. It really does shape who they are and it also impacts ideas they bring to their clients. The spaces need to promote collaboration and inspire creative problem solving. Designers do not want to bring their potential clients into an out of date space and then pitch them new and interesting ideas that their office is unwilling to try. It was obvious to me that the employees in the Shive Hattery's Iowa City office are genuinely excited to be working in there new office. I have to admit, I was excited too! It almost makes me want to trade in my self employment status and go work for them in Iowa City just to be able to work from this space (and whoop them all at ping pong over lunch). First, I want to say thank you to all the people who sent me their photos using leading lines from tip#1! I saw a lot of really interesting shots! Keep them coming. Staying with the compositional theme of the first post I wanted to challenge you to use a technique I call Extreme Composition. It is actually really easy to do. Unfortunately though I have found that people either love it or they hate it. That being said, it is one of my favorite things to do in the right situation. The idea behind using negative space is that often we focus our attention on the subject too much. By doing that we often neglect the negative space. Ultimately you are trying to tell a story in every photograph. The negative space can often help you tell or leave out specific parts of that story. I would say these example photographs are using extreme composition to exaggerate the negative space. This draws the eye to the subject even more. An interesting effect is you can at times confuse the viewer of size, scale, and even location of the subject. It's a fun little tool to have in your bag, I find myself doing it all the time. Let's be honest, photography is extremely popular these days. With virtually everyone carrying their phone/camera in their pocket everywhere they go much more images are being made on a daily basis. I am starting a little blog series to give out simple cell phone photography tips that are extremely easy to implement. Our cell phone cameras do limit creativity compared to DSLRs because they do not allow for us to make decisions about depth of field and have very limited exposure options. Because of that, we are forced to be more creative in our composition to make our cellphone images better. Most of these tips are based on composition, but I will get into other subjects further down the road. This is exciting to me because composing the photo is my favorite part of the entire process. Creative challenges will only make us better, so bring it on aperatureless cellphone!!! One thing that can make an image great is the depth that can be created. Like I mentioned before, depth of field is not something we can control at this point with our cellphones. So how can we create a 3D feel in a 2D medium without an aperture to assist us? One of the easiest ways to do this is to utilize natural leading lines in a scene. I start with leading lines because, well honestly, it is my favorite technique. Shapes and lines in pictures are what inspired me to pursue photography as a career. Leading lines are everywhere, we just have to learn to see them. The image above has great depth for several reasons. The first of course is the road has a grass line right down the middle leading us deep into the woods. The second is the simple fact that it is a road. Naturally our subconscious will take our eyes down that road because we spend so much time in cars doing that exact thing. That in reality is a totally flat picture on a flat computer screen, but it looks really deep because of the lines. The same goes for the image below. One of the challenges of seeing leading lines is the fact that they aren't always there. When composing the image below I had to wait all day for those lines to show up. Our first morning on vacation a couple years ago I woke up and had coffee on the porch, looking at the line of trees close to the water I new there would be some amazing shadows and lines if I came back and made a picture just before sunset. I was right and created this image which is one of my favorite cell phone shots I have ever taken. These leading lines once again create depth, and in this case also mood because of the time of day. Leading lines also give you control over the viewer eyes. This sounds crazy but it's true. When looking at the image below I would put money on the fact the your eye started at the bottom right of the frame, moved up and then back down ending at the bottom left. I made your eyes do that with the very specific composition that I chose. This image is the most obvious example I could find to illustrate this control but this fact is very true of many great images. So no more boring flat photos! Go out there and use the leading lines to create interest and depth. I would love to see some of your images using this tecnique! You can e-mail them to me at aj@ajbrownimaging or just leave a comment with them in the comment section. I always say that photography is a problem solving profession. The biggest problem I had last week while shooting at MindFire Communications' new office was deciding what not to shoot. Every time I turned around I saw another angle that I would have loved to photograph but sadly I had a limited amount of time so I had to be very selective where I spend my energy. Here are a couple of angles I did decide to shoot in the eye popping space designed by Conceptual Designs Inc.